Sorry, this item is currently out of stock, but will be added to our next order from this supplier. 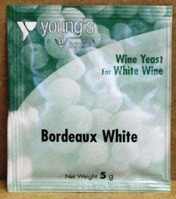 This strain of wine yeast was chosen to confers exceptional depth and complexity to white wines - perfect for up to 5 gallons of Bordeaux style Whites, rather than the usual red Bordeaux (Claret type) wines. Sprinkle sachet contents onto surface of juice, wait for 15 minutes the stir.